Once you have mastered drawing a small truck turning this into a bigger truck is easy. You need to stretch the truck’s body and make the cabin short and stubby. Draw a longer line than the one you started for the small truck and put a longer rectangle on top of it. 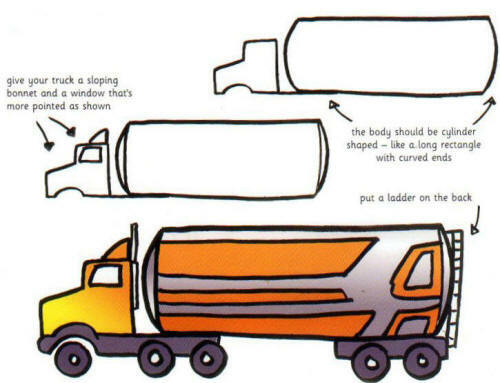 Give the body of your truck some extra wheels then follow the steps below to draw the cabin. You could colour in your truck like this. How about turning your simple truck design into a shiny tanker? Add the wheels then colour in /our tanker so it’s ready to speed off the page.